I have just got a Raspberry Pi 3 Model B+. I initially installed Raspbian Pi OS on it temporarily to prove that it works and to prove that my touchscreen that I also got for the pi works OK. I have now tried to flash Android Things image to the SD card, both using the console setup utility and manually using Etcher on two different SD cards. 1 of the SD cards is a 16GB class 10 SD card, the other is 8GB not sure what class though, both though are able to run raspbian OS. However, when android things is flashed to the SD card, no boot attempt seems to be made. The red power LED comes on but the ACT light doesn't do anything. From what I've read this means that the SD Card is being read. Looking at the SD card it looks like its not flashing properly but I'm not 100% sure. 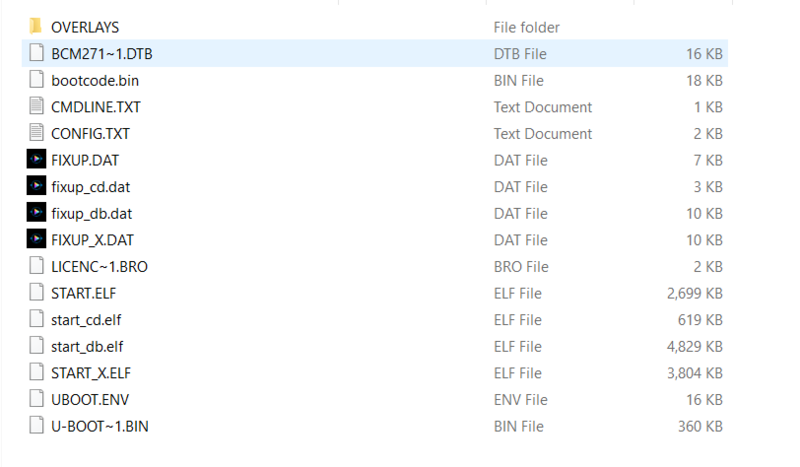 I've taken a screenshot of windows explorer to show what the SD card contains. As mentioned earlier both SD cards can successfully boot from the Raspbian OS and when booting this image the ACT light flashes but nothing at all when trying to boot from Android Things. Android Things hasn’t been updated for the Pi3B+ yet.